Based on a survey of 252 pharmacists in the chain, independent, hospital and specialty settings, the research aims to pinpoint how members of the profession are spending their days and how they think pharmacy should evolve to enhance patient care. As expected, pharmacists in all of the segments report that they devote the largest block of time to dispensing medications — a figure that ranges from 16% for specialty pharmacists to 38% for those who are employed by chains. An additional 29% of chain pharmacists’ work hours are spent on such tasks as business operations, wrangling with third-party payers and purchasing-related activities. That leaves only slightly more than 30% of the day for such patient-centric activities as counseling and medication therapy management; administering immunizations; and communicating with physicians and other health care providers. Pharmacists are eager to do just that. Seventy-five percent of chain pharmacists, for instance, think they should devote more time to counseling patients than the 10% they do today. In striking contrast to the status quo, the top six areas of activity that they think they should focus on are all related to patient care. There is widespread hope that pharmacy practice is currently headed in that direction. 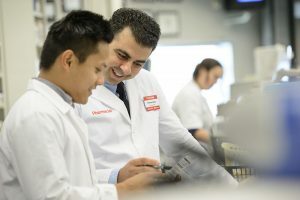 Three-quarters of chain pharmacists think that they will be doing more patient counseling in five years, 85% expect to be more involved in MTM, and 66% foresee playing a larger part in preventative care screenings, according to the AmerisourceBergen study, which was conducted in cooperation with business intelligence firm Maru/Matchbox. Achieving that vision of pharmacy practice won’t be easy, as evidenced by the formidable array of barriers to optimum patient care identified by the research. At least 75% of professionals in all practice settings cite reimbursement levels as a significant or minor challenge. For chain pharmacists, whose stores generate higher prescription volume than other practice settings, staffing challenges and “lack of bandwidth” are the top concern, while independents’ biggest headache, after reimbursements, is contracting with pharmaceutical manufacturers and payers. Pharmacists are, however, optimistic that such measures as the development of closer ties with prescribers, better inventory management tools, predictive modeling and data sharing will alleviate problems and help move the profession — and, along with it, the nation’s health care system — forward. Everyone with a stake in health care should do everything they can to facilitate that transformation. Pharmacists are the most accessible health care providers in the country and consistently rank among the most trusted professionals in public opinion polls. The health care system would benefit greatly by capitalizing on those strengths, along with pharmacists’ unequalled understanding of pharmaceutical products and their effect on the body, to enable more patients to achieve the best possible outcomes at the lowest possible cost.